On Tuesday, June 2, 2009, from 9:00 PM to 11:00 PM, millions around the world watched a television program called Earth 2100. It was presented by American Broadcasting Company (ABC) and hosted by ABC journalist Bob Woodruff. The two-hour special explored what a worst-case future might look like if humans do not take action on current or impending problems that could threaten civilization. The problems addressed in the program included climate change, food insecurity and misuse of energy resources. We have been given a planet to live on. In the end, cockroaches would prove to be more intelligent than humans if humans destroy themselves. Intelligence is really a survival skill for the entire species and that which survives proves intelligent on a species level. ​The program included predictions of a dystopian Earth in the years 2015, 2030, 2050, 2085, and 2100 by scientists, historians, social anthropologists, and economists, including Jared Diamond, Thomas Homer-Dixon, Peter Gleick, James Howard Kunstler, Heidi Cullen, and Joseph Tainter. According to Executive Producer Michael Bicks, the program was developed to show the worst-case scenario for human civilization. Again, its not that these events will happen dot on time — rather, that if we fail to seriously address the complex problems of climate change, resource depletion and food security, they are much more likely to happen. Earth 2100 : The Final Century of Civilization? Planet is at Risk and experts warn that factors like food insecurity, resource depletion, climate change could bring catastrophe in next century. It's an idea that most of us would rather not face -- that within the next century, life as we know it could come to an end. Our civilization could crumble, leaving only traces of modern human existence behind. 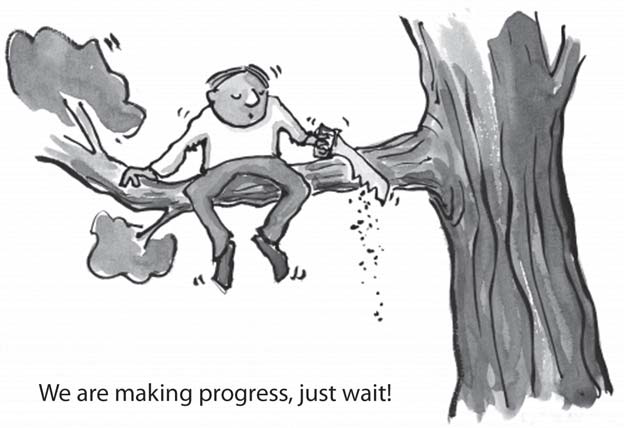 To change the future, first we have to perceive it and in order to plan for the worst, we must anticipate it. It seems outlandish, extreme - even impossible. But according to cutting edge scientific research, it is a very real possibility. And unless we make drastic changes now, it could very well happen. Experts are giving a stark warning that unless we change course, these issues have the potential to converge in the next century with catastrophic results. I am the earth. You are the earth. The Earth is dying. You and I are dying and You and I are the murderers. Michael Klare, professor of peace and world security studies at Hampshire College says, "We have no new source of energy on the horizon that's currently capable of being developed on a large enough scale to replace the supply of oil in any near-term framework." If the cost of gasoline skyrockets, few may be able to afford to maintain the lifestyles to which we've grown accustomed. But will that convince us to change our ways? A really deep change is required in the ways we think and do things in life. toxic waste, acid rains, rising temperatures, melting ice, nuclear waste, pesticides, violence, wars, mounting trash, soil loss, water crisis, biodiversity loss, rainforest destruction, ozone layer depletion, environmental warfare, are scorching our lives, scalding our planet. ​When it comes to human history, the themes of civilizations rising and falling repeats itself ad nauseum. This collapse occurs mostly when the civilizations fail to take into account their environment and when there comes a point where the growth and need for resources outstrip what their environment can provide. Compared to the rest of human history, our story will be no different. When the environments in which preceding cultures flourished failed to support their needs, these civilizations collapsed. Why should our civilization be any different? Such an environmental collapse brought down the Minoans, the Indus Valley people, Mesopotamia, Egypt and the Hsieh Kingdoms, to name a few. ​When the land failed to provide, people moved to where they thought there was better land and even fought the current occupants for that land. Today also, due to climatic changes, many parts of the world like Australia, Africa, parts of Asia and Europe are facing increasing desertification. Redistribution of rainfall is taking place and it can have dangerous implications for world’s food supply. Climatic changes have always taken place and the world has always changed but the scale at which things are happening is scary. Human history is littered with numerous examples to support this idea. In Meso America, the Maya and Anasazi peoples found their existences endangered as their crops failed and the Sonoran desert advanced north into what is now Colorado, Utah, New Mexico and Arizona. They are thinking it is paradise. And the paradise is lost every ten years or fifteen years by the bombing. German bombs the France, and France bombs the... This is their paradise. So let them understand that "You are all fools. You are fool's paradise. This is life, what we are doing." Teach them so that the fools will understand what is life. They are manufacturing atom bomb. Western civilization, which is a world civilization now is on the decline. The problems that precipitated this decline could be traced to the 18th Century, when some of the countries started importing resources from far-flung parts of the earth, to fuel the industrial revolution back home. They grew so accustomed to it that they became interdependent on the steady flow of these resources coming to them. However, they failed to consider what kind of resources it took to get those resources and that was probably their undoing. This was the dawn of an era of overconsumption and greed, an era of colonization and exploitation. People that can not feed itself off of what they produce will fail. They either move, die out, or resort to warfare to get what they want or a combination of all of these. In the last few decades also, we have seen this scenario play itself in various parts of the world. Thus killing animals for food, fur, leather, and cosmetics is one of the most environmentally destructive practices taking place on the earth today. Right now we raise about 40 billion animals for food. Animal based diet is leading to a global health crisis unparalleled in human history. Dietary advice on the subject of global warming and environmental health was never as definitive as it is today. The United Nations has called on governments and individuals to open their eyes to climate change, calling it "the most serious challenge facing the human race." More than any other factor, how we meet that challenge will depend on what we eat. ​A tree is our most intimate contact with nature and forests form the life line of Earth’s atmosphere. In last two centuries, over 90% of the Earth’s forests have been butchered and this is one of the most prominent feature of modern ecocidal policies. ​You want to save forests? Just stop eating meat! Each person who becomes a vegetarian saves one acre of trees per year. According to Vegetarian Times, half of the annual destruction of tropical rain forests is caused by clearing land for beef cattle ranches. Each pound of hamburger made from Central American or South American beef costs about 55 square feet of rain forest vegetation. Forests all over the world are being cut so that Americans, Europeans and Japanese can have their hamburgers. Its a criminal waste of precious resources. ​In the United States, about 260 million acres of forest have been cleared for a meat-centered diet. About 40% of the land in the western United States is used for grazing beef cattle. This has had a detrimental effect on wildlife. ​About a fifth of the world's land is used for grazing meat animals - twice the area used for growing crops. Because of the deforestation, soil erosion and desertification meat industry causes, it is fundamentally unsustainable and has an extremely negative impact on the environment. Thirty percent of the earth's land is now occupied by livestock, with another 33 percent devoted to GMO feed crops, and this number is expanding every year. Seventy percent of previously forested land in the Amazon has been converted into cropland and pastures, destroying biodiversity, introducing carcinogenic pesticides, and playing a primary role in pushing species toward extinction at a rate 500 times of that we ought to be experiencing according to models based on fossil records. ​Inevitably, intensive animal agriculture depletes valuable natural resources. Instead of being eaten by people, the vast majority of grains harvested is fed to farm animals. For this wasteful and inefficient practice, agribusinesses exploit vast stretches of land. Forests, wetlands, and other natural ecosystems and wildlife habitats have been decimated. Scarce fossil fuels, groundwater, and topsoil resources which took millennium to develop are now disappearing. Of all agricultural land in the United States, 80-87% is now used to raise animals for food. They are misusing these trees by cutting, manufacturing paper, heaps of paper, in each house throwing daily. They do not read, but they are supplied heaps of paper and cutting these trees. Simply waste. Now wood and paper shortage all over the world. It takes so much time to grow, and one day they cut hundreds of trees like this and put into the paper mill. And heaps of paper is given every house, and he throws away.- Then you bring garbage tank. In this way, waste. The space equivalent to seven football fields is being destroyed in rainforests every minute; 50 million acres of tropical forest in Latin America alone have been cut down for livestock production since 1970. In Canada also, local wilderness is being destroyed for more and more grazing land for livestock. There is plenty of food. It is just not reaching human stomachs. Of the 2.13bn tonnes consumed in 2008, only 1.01bn, according to the UN’s Food and Agriculture Organisation (FAO), reached people. The rest was used up by meat industry and biofuel industry. ​The great food recession is sweeping the world faster than the credit crunch. The price of rice has risen by three-quarters in the past year, that of wheat by 130%. There are food crises in 37 countries. One hundred million people, according to the World Bank, could be pushed into deeper poverty by the high prices. But at 2.1bn tonnes, last year’s global grain harvest broke all records. It beat the previous year’s by almost 5%. If hunger can strike now, what will happen if harvests decline? ​While 100 million tonnes of food will be diverted this year to feed cars, 760 million tonnes will be snatched from the mouths of humans to feed animals. This could cover the global food deficit 14 times. If we care about hunger, we have to eat less meat. ​Traditionally, most societies would eat meat only on special occasions unless it was a hunting, foraging tribe. Meat as staple diet is unknown in any traditional culture. ​It is depressing to consider that throughout the last big famine in Ethiopia, the country was exporting desperately needed soy to Europe to feed farmed animals. The same relationship held true throughout the famine in Somalia in the early 1990's. The same relationship holds between Latin America and the United States today. As an example, two-thirds of the agriculturally productive land in Central America is devoted to raising farmed animals, who are exported or eaten by the wealthy few in these countries. The world's cattle alone consume a quantity of food equal to the caloric needs of 8.7 billion people -- more than the entire human population on Earth. Meanwhile, the UN says that 1000 million people are suffering from "nutritional deficiency" (i.e. they're starving). Thus more than half of the world’s grain is consumed by animals that are later slaughtered for meat. Meat production is a very inefficient process. It takes 16 pounds of grain and soybeans to produce 1 pound of feedlot beef. If people were to subsist on grains and other vegetarian foods alone, this would put far less strain on the earth’s agricultural lands. About 20 vegetarians can be fed from the land it takes to feed 1 meat eater. During the process of converting grain to meat, 90% of the protein, 99% of the carbohydrates, and 100% of the dietary fiber are lost. As soon as you make misuse, the supply will be stopped. After all, the supply is not in your control. You cannot manufacture all these things. You can kill thousands of cows daily, but you cannot generate even one ant. And you are very much proud of your science. You see. Just produce one ant in the laboratory, moving, with independence. And you are killing so many animals? Why? So how long this will go on? Everything will be stopped. Just like a child. Mother is giving good, nice foodstuff, and he’s spoiling. So what the mother will do? “All right. From tomorrow you’ll not get.” That is natural. Eighty percent of the corn raised in the United States is fed to livestock, as well as 95% of the oats. Altogether, 56% of all agricultural land in the United States is used for beef production. If all the soybeans and grain fed yearly to US livestock were set aside for human consumption, it would feed 1.3 billion people. In his book “Proteins: Their Chemistry and Politics,” Dr. Aaron Altshul notes that, “In terms of calorie units per acre, a diet of grains, vegetables and beans will support twenty times more people than a diet of meat. If the earth’s arable land were used primarily for the production of vegetarian foods, the planet could easily support a population of twenty billion and more. Really, it comes down to this: generating meat for human consumption requires vast amounts of land that could be used to feed people, and is therefore withholding food from millions of starving people. Bad soil is bad for global health, and the evidence is mounting that the world' soil is in trouble. We're dead without good soil. Soil holds minerals and organic compounds critical to life. Without good soil we have got nothing. ​ All over the world, more than seven and a half million acres of soil has been degraded. That's larger than the U.S. and Canada combined. What remains is ailing as a result of compaction, erosion and salination making it near impossible to plant and adding to greenhouse gases and air pollution. Soil degradation is putting the future of the global population is at risk according to a National Geographic article by Charles Mann. Civil unrest in Latin America, Asia and Africa have been attributed to a lack of food and affordable food as a result of poor soil. Currently, only 11-percent of the world's land feeds six billion people. Experts estimate that by 2030 the Earth's population will reach 8.3 billion. Farmers will need to increase food production by 40- percent. But not much soil remains. Scientists don't know much and don’t care either about this critical resource. Overgrazing and the intensive production of feed grain for cattle and other meat animals results in high levels of soil erosion. According to Alan B. Durning of the Worldwatch Institute (1986), one pound of beef from cattle raised on feedlots represents the loss of 35 pounds of topsoil. Over the past few centuries, the United States has lost about two-thirds of its topsoil. ​In other countries, such as Australia and the nations of Africa on the southern edge of the Sahara, cattle grazing and feed-crop production on marginal lands contribute substantially to desertification. ​Burning of oil in the production of feed grain results in air pollution, including carbon dioxide, the main cause of global warming. Another major source of air pollution is the burning of tropical forests to clear land for cattle grazing. ​The meat industry burns up a lot of fossil fuel, pouring pollutants into the air. Calorie for calorie, it takes 39 times more energy to produce beef than soybeans. The petroleum used in the United States would decrease by 60% if people adopted a vegetarian diet, as per Vegetarian Times, 1990. ​The meat industry, in addition to producing carbon dioxide, is also responsible for other greenhouse gases, such as methane. Methane is produced directly by the digestive system of grain fed cows. This greenhouse gas is considered very dangerous because each molecule of methane traps 20 times more heat than a molecule of carbon dioxide. ​​Cows are being fed unnatural diet of soya, corn and host of other grains. Cows do need grains but in very small quantities. By nature’s way, cows are meant to live on grass and vegetation. Each year about 500 million tons of methane enter the atmosphere, contributing about 18% of the total greenhouse gases. Cows which are kept in feedlots and force-fed artificially, account for 60 million tons of the methane, about 12%. Therefore, methane emitted by feedlot cows amounts to 2% of the total greenhouse gas emissions. In India, there are about 270 million cows, but 99.9% of them are range fed. They are now killing animal, but animal lives on this grass and grains. When there will be no grass, no grains, where they will get animal? They’ll kill their own son and eat. That time is coming. Nature’s law is that you grow your own food. But they are not interested in growing food. They are interested in manufacturing bolts and nuts. ​​​In the context of the global water supply, the impact of animal agriculture threatens utter catastrophe. very kilo of beef requires 16,000 litres of water, according to the Institute for Water Education. This means a single person can save more water simply by not eating a pound of beef than they could by not showering for an entire year. ​​​Factory farming is responsible for 37 percent of pesticide contamination, 50 percent of antibiotic contamination and one-third ​of the nitrogen and phosphorus loads found in freshwater. Nearly half of all water consumed in the developed countries is used to raise animals for food. ​​Poisoning water is bad enough, but depleting the supply is suicidal. The majority of the earth's water is now used to support animal agriculture, and much of it cannot be reclaimed. ​​About 50% of the water pollution is linked to livestock. Pesticides and fertilizers used in helping grow feed grains run off into lakes and rivers. They also pollute ground water. In the feedlots and stockyard holding pens, there is also a tremendous amount of pesticide runoff. Organic contaminants from huge concentrations of animal excrement and urine at feedlots and stockyards also pollute water. This waste is anywhere from ten to hundreds of times more concentrated than raw domestic sewage. According to a German documentary film (Fleisch Frisst Menschen [Flesh Devours Man] by Wolfgang Kharuna), nitrates evaporating from open tanks of concentrated livestock waste in the Netherlands have resulted in extremely high levels of forest-killing acid rain. ​​Feeding the average meat-eater requires about 4,200 gallons of water per day, versus 1,200 gallons per day for a person following a lactovegetarian diet. While it takes only 25 gallons of water to produce a pound of wheat, it takes 2,500 gallons of water to produce a pound of meat. ​​​The animals raised for food in the US alone produce 130 times the excrement of the entire human population on Earth, at a rate of 86,600 pounds per second. Only a sixth of this excrement is used as fertilizer; the rest is just dumped into lakes and rivers, untreated. Slaughterhouse runoff is killing millions of fish, and is the main reason why 35% of Earth’s rivers and streams are "impaired". In countries with concentrated animal agriculture, the waterways have become rife with a bacteria called pfiesteria. In addition to killing fish, pfiesteria causes open sores, nausea, memory loss, fatigue and disorientation in humans. Even groundwater, which takes thousands of years to restore, is being contaminated. For example, the aquifer under the San Bernadino Dairy Preserve in southern California contains more nitrates and other pollutants than water coming from sewage treatment plants. ​​​But it's not only fresh water sources that are at risk; ocean waters are also imperiled. Dead zones, vast stretches of coastal waters in which nothing can live, are created by untreated hormone, nitrate and antibiotic laden slaughterhouse waste seeping into the soil, groundwater and rivers before contaminating the ocean. According to the EPA, In USA, 35,000 miles of rivers in 22 states and groundwater in 17 states has been permanently contaminated by industrial farm waste. ​​​One pig factory farm produces raw waste equivalent to that of a city of 120000 people -- except unlike a city, it doesn't have a waste treatment facility. Its raw wastes are dumped straight into surrounding rivers and lakes. ​​​Many of the worst human diseases — BSE, TB, avian flu, West Nile virus, bluetongue, swine flu and now monkey malaria— all are associated with animals of modern meat industry which are kept in crammed, unhygienic conditions in unnaturally large numbers. ​​​​According to a 2006 UN-sponsored report titled "Livestock's Long Shadow," animal factory farming plays a major role in every aspect of environmental collapse, from ozone depletion to ocean dead zones. If your energy is all engaged in manufacturing tires and wheels, then who will go to the... Actually I have seen in your country. Now the farmers’ son, they do not like to remain in the farm. They go in the city. I have seen it. The farmers’ son, they do not like to take up the profession of his father. So gradually farming will be reduced, and the city residents, they are satisfied if they can eat meat. And the farmer means keeping the, raising the cattle and killing them, send to the city, and they will think that “We are eating. What is the use of going to...” But these rascals have no brain that “If there is no food grain or grass, how these cattle will be...?” Actually it is happening. They are eating swiftly. ​​​​Factory farms, which hold tens of thousands of animals per facility in windowless warehouses, are responsible for more than 18 percent of greenhouse gas emissions worldwide. Emissions from industrial farming are not just caused by cow burps. They are also caused by the one billion tons of waste (including 64 percent of ammonia emissions, the primary producer of acid rain) produced by suffering animals held in extreme confinement. ​​​​Containing high levels of hormones and pesticides, this untreated toxic waste is converted into concentrated liquid sewage, known as "slurry." Stored in vast 25-million-gallon lagoons, this endlessly increasing waste releases gases into the atmosphere before some of it gets used to fertilize feed crops. The leading cause of soil and groundwater contamination, lagoon breaches and fertilizer spills are increasingly common. ​​​​Even as these animal farms produce more emissions than general transportation, they are also responsible for a majority of emissions produced by all their transportation functions. Most food animals travel thousands of miles in their lifetimes as they are transported between various operations such as stockyards and slaughterhouses. Maintaining the support industries of factory farming also takes a toll on local environments. Planting, fertilizing, irrigating and harvesting feed crops, continually pumping water and sewage, running packing plants and slaughterhouses, all rely on heavy machinery and fossil fuel consumption. ​​​​​Raising animals for food requires more than one-third of all raw materials and fossil fuels used in the United States. Producing a single hamburger patty uses enough fossil fuels to drive a car 20 miles. Meat production requires 10-20 times more energy per edible tonne than grain production. ​​​​​The human body cannot deal with excessive animal fats in the diet. As early as 1961, the Journal of the American Medical Association stated that ninety to ninety-seven percent of heart disease, the cause of more than half of the deaths in the United States, could be prevented by a vegetarian diet. Many studies have established the relationship between colon cancer and meat eating. One reason for the incidence of cancer is the highfat, low-fiber content of the meat-centred diet. The result is a slow transit time through the colon, allowing toxic wastes to do their damage. Meat, while being digested, is known to generate steroid metabolites possessing carcinogenic properties. ​​​​​Because of the filthy, overcrowded conditions forced upon animals by the livestock industry, vast amounts of antibiotics must be used, but such rampant use of antibiotics naturally creates antibiotic-resistant bacteria that are passed on to those who eat the meat. The US FDA estimate that penicillin and tetracycline save the meat industry $1.9 billion a year giving them sufficient reason to overlook the potential health hazards. In addition to dangerous chemicals, meat often carries diseases from the animals themselves. ​Crammed together in unclean conditions, force-fed and inhumanely treated, animals destined for slaughter contact many more diseases than they ordinarily would. Meat inspectors attempt to filter out unacceptable meats, but because of pressures from industry and lack of sufficient time for examination, much of what passes is far less wholesome than the meat purchaser realizes. In U.S.A. also, there are so much land vacant. They’re not utilizing... Whatever production, they... Sometimes they throw it in the water. And, I, I have heard in this Geneva, that there was excess of milk production. Therefore they want to kill twenty-thousand cows to reduce the milk production. This is their brain. Actually, there is no brain. So they, for brain, they should come to these sastras. They should take guidance. Produce. Produce, utilize. But they’ll not utilize. Rather, the limited number of people... At least in India, all the villagers, they have been drawn in the city for producing bolts and nuts. Now eat bolts and nuts. ​Despite these horrifying statistics, global production of meat is projected to double in the next 10 years. ​Average American is already consuming more than 200 pounds of meat per year and rest of the world is trying to follow in their footsteps. In an immediate sense, adopting a meat-free diet may be the most rewarding and effective step an individual can take to help save the planet. ​Viewing animals as commodities has had a profoundly negative impact on understanding the world we live in. There is no more important task at hand than combating the false notion that the entire natural world is economically quantifiable or exists simply for our purposes alone. ​An animal, an ocean, a forest, a species...and humanity are not separate, but intimately connected in every way. The world consumes 240 billion kilos of meat each year. But more than 75 per cent of what is fed to an animal is lost through metabolism or inedible parts such as bones. ​The UN and OIE estimate that in coming decades there will be billions of additional consumers in developing countries eating meat which is factory farmed in developing countries, but currently only about 40 out of the around 200 countries in the world have the capacity to adequately respond to a health crisis originating from animal disease (such as avian flu, West Nile virus, bluetongue, and foot and mouth disease). ​Widespread use of antibiotics increases the chance of a pandemic resistant to known measures, which is exacerbated by a globally distributed food system. Decreased genetic diversity increases the chance of a food crisis. ​Many people may gladly recycle paper and aluminum cans or take the subway rather than drive to work, they get home and cook up a steak for dinner, unaware that the environmental damage caused to produce that steak far outweighs their other environmental efforts. ​We have to make our choice now.... steak on our platter or our very survival. ​There are still parts of the world where people live a pre-industrial life. For example Indonesian Borneo. Daily life in Borneo's upcountry is usually pleasantly dull, as chickens scratch around, the women fan rice on mats to dry it, thunderstorms roll through, the sun dries the muddy paths, flowers riot into bloom, and it all starts over again the next day. Pastoral Mongolia partially fits the category too, with its world revolving around camels, cows and sheep rather than rice and bananas. ​Pre-industrial life was easy on resources - both human and natural. Before capitalism, most people did not work very long hours. The tempo of life was slow, even leisurely; the pace of work relaxed. People were at peace and so was Earth’s environment. ​As we have seen in earlier pages, in a vast number of ways and places, the biosphere of this planet is undergoing a great deal of damage. Parts of the environment have already been rendered uninhabitable through toxic wastes and nuclear power plant disasters, while systemic pollution, ozone holes, global warming, and other disasters are increasingly tearing the fabric on which all life depends. That such damage is wrought overwhelmingly by corporations in a competitive international market economy has never been clearer, while the need to replace the existing society with one such as social ecology advances has never been more urgent. ​Modernization, the replacement of machines for muscle, is a universal social solvent. Even when resisted by traditional leaders, modernization erodes established social, economic patterns, and threatens ecosystems. ​Peasants and tribal members ultimately succumb to mechanisms yielding enhanced productivity. They rapidly scrap traditional practices in favor of those more materially productive. ​This modernization has taken a toll on our connection with nature and general web of life. We, like all other life forms, are products of our environment. Its arrogance and ignorance to think that we can survive in isolation. The delicate web of life can not be disturbed without endangering the human survival itself. ​Any one with an intact brain would admit the obvious and commonplace fact that animals play a conspicuous part in the life of man. Animals affect everyone’s life, whether you’re an animal-lover, animal-hater, animal-eater or animal-saver. ​Gaia is the primal Greek goddess personifying the Earth. Gaia is a primordial deity in the ancient Greek pantheon and considered a Mother Goddess. ​Etymologically Gaia is a compound word of two elements. Ge, meaning "Earth" and ‘aia’ is a derivative of an Indo-European stem meaning "Grandmother". ​This epical name was revived in 1979 by James Lovelock, in ‘Gaia: A New Look at Life on Earth’ which proposed a Gaia hypothesis. The hypothesis proposes that living organisms and inorganic material are part of a dynamic system that shapes the Earth's biosphere, and maintains the Earth as a fit environment for life. In some Gaia theory approaches, the Earth itself is viewed as an organism with self-regulatory functions. Further books by Lovelock and others popularized the Gaia Hypothesis, which was widely embraced and passed into common usage as part of the heightened awareness of environmental concerns of the 1990s. ​Gaia has been widely held throughout history and has been the basis of a belief which still coexists with the great religions. Today the very word ‘Gaia’ has come to mean ecology and sustainability. There is a thriving green community which runs the portal Gaia.com. ​By using interchangeable words for cow and Earth, Vedas, the oldest repository of knowledge, emphatically state that cow is a representation of the planet earth itself. In almost all Indian languages, cow is knows as ‘gai’. 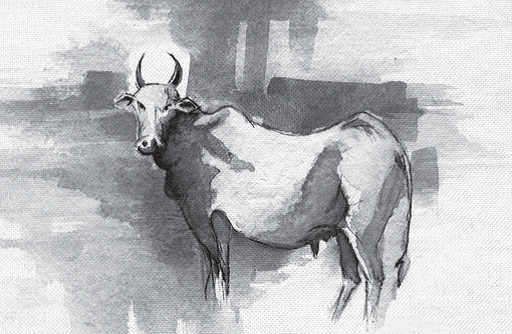 ​The cow is a complete ecology, a gentle creature and a symbol of abundance. The cow represents life and the sustenance of life. It is so giving, taking nothing but grass. For thousands of years, mankind lived happily, depending on land and cows. To live with cows is to live in perfect cooperation with nature. In a society if you only had cows and agricultural pursuits, you wouldn’t require anything else in the name of artificial luxuries. Knowing something of the current state of the environmental movements, we can say with amazing certainty that cow protection and ox power are the very epitome of the bottom line in sustainability. No matter how we look at the topic, there is nothing that comes as close to solving all the problems of the modern world as do cow protection and ox power. Just name an issue of the day: air and water pollution, crime, poverty, unemployment, war, famine, hunger, disease, pestilence, floods, earthquakes, over grazing, global warming, deforestation, etc. A society based on the Vedic principles of cow protection and ox power knows none of these issues. Rama-rajya, or government by Lord Ramachandra, defines a society which is happy in all respects and where there exists perfect harmony between man, nature and other life forms. This is a society wherein no one even- suffers from physical ailments or mental agony. In this society, the demigods or the controlling deities of nature are pleased to adjust universal affairs for the complete satisfaction of all the inhabitants, including even those lower than humans (the animals, birds, plants, fish, reptiles, and germs). And cow protection forms the backbone of such an ideal society. 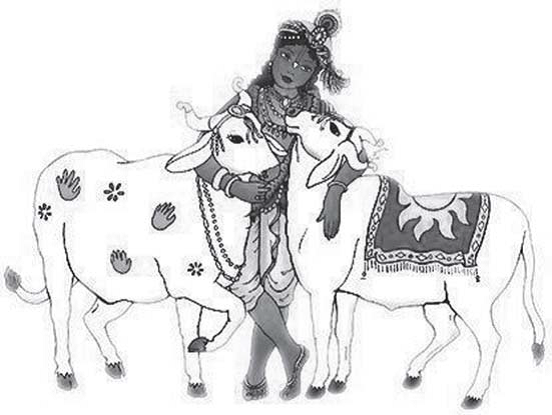 Vedic culture’s concern for nature and life in general is reflected in an attitude of reverence for the cow. Cow represents the Vedic values of selfless service, strength, dignity, and non-violence. For these reasons, although not all Hindus are vegetarian, they traditionally abstain from eating beef. Vedic seers could see into the future... to our time when we would feed cows ground up cows and make mad cow disease... a time when mankind would be all bad... they saw us abusing everything...from our fellow creatures to nature all around us. ​Africans for thousands of years used cow dung cakes as fuel. In 18th and 19th century missionaries taught them to give up this ‘uncivilized’ practice. People turned to forests for fuel and in no time the continent was bald. The bull is the emblem of the moral principle, and the cow is the representative of the earth. When the bull and the cow are in a joyful mood, it is to be understood that the people of the world are also in a joyful mood. 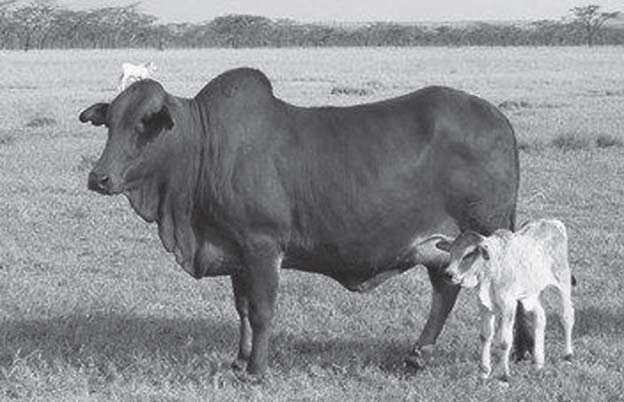 The reason is that the bull helps production of grains in the agricultural field, and the cow delivers milk, the miracle of aggregate food values. The human society, therefore, maintains these two important animals very carefully so that they can wander everywhere in cheerfulness. But at the present moment in this age of Kali both the bull and the cow are now being slaughtered and eaten up as foodstuff by a class of men who do not know the brahminical culture. The cow dung is an important source of producing non-conventional energy. It is a substitute for firewood and electricity. As a result, the forests can be conserved and their faunal wealth can be enriched. Every single aspect of cow protection interweaves with protection of our environment. In fact, care for cow represents care for life and nature in general. The cow is central to our life and bio-diversity. Cow protection has a great potential in poverty alleviation and employment generation. It deserves full support at all levels. The universe operates under the law of cause and effect. Every action involves and results in a reaction. In Vedic terminology, this is called law of karma. Put in simple words, law of karma is all about reaping what you sow. Life evens out. We have to pay for our deeds. Law of Karma has had quite a karma. Long after India's seers immortalized it in the Vedas, it suffered bad press under European missionaries who belittled it as "fate" and "fatalism," and today finds itself again in the ascendancy as the subtle and all-encompassing principle which governs man's experiential universe in a way likened to gravity's governance over the physical plane. Like gravity, karma was always there in its fullest potency, even when people did not comprehend it. Each of us as individuals, as well as each group and nation, is continually creating karma, both good and bad. All thoughts, words, or actions will sooner or later come full circle and return home to their creators. This is the universal Law of Cause and Effect, which is operating all the time, just like gravity, whether we choose to believe it or not. "What goes around, comes around" is a statement of fact. An African tribe puts this in a colorful way: "He who excretes on the road, meets flies on his return." Karma plays a leading role in the world’s drift toward environmental catastrophe, and a large part of this karma is generated by unnecessary killing of animals. Physicists M M Bajaj, Ibrahim and Vijayraj Singh have proposed the theory that animal slaughter and natural calamities like earthquakes have an interrelationship and research papers on this theory have been presented in many international conferences. The theory presents the hypothesis of large-scale abattoir activity as the causative agent for major earthquakes. They put forward a forceful plea to stop slaughter of animals, birds, and fish with special reference to cows. Their theory makes an interesting reading because science still does not have proper answers as to why the earthquakes happen and how they can be predicted with reasonable accuracy. This theory is being hailed for filling the gaps in the science of seismology, still a nascent science. The theory, with the help of highly technical and scientific jargon, attempts to explain that butchering of animals in the abattoirs worldwide has something to do with the quakes. The theory examines the complex role of nociceptive waves (or the waves generated by the animals on the verge of being butchered) in shear-wave splitting which is related to seismic anisotropy. This splitting is associated with the cracks in the crust aligned by stress. The origin of earthquakes due to the interaction of nociception waves with gravity waves is critically examined in the theory. An earthquake of 8 Richter occurs only when the resonant frequency is extremely high. Low frequency resonances lead to earthquakes of 0.1 to 0.2 Richter. Low frequency resonances are hardly felt or realised by the ordinary people. High frequency resonances (originating from the slaughter of millions of animals daily for years together) lead to powerful singularities with the gravity waves. In this way the theory proposes that shear wave splitting mainly occurs due to aligned fluid-filled inclusions and abattoir activity. If one gives another living entity unnecessary pain, one will certainly be punished by the laws of nature with a similar pain. Although the hunter Mrgari was uncivilized, he still had to suffer the results of his sinful activities. However, if a civilized man kills animals regularly in a slaughterhouse to maintain his so-called civilization, using scientific methods and machines to kill animals, one cannot even estimate the suffering awaiting him. So-called civilized people consider themselves very advanced in education, but they do not know about the stringent laws of nature. According to nature's law, it is a life for a life. We can hardly imagine the sufferings of one who maintains a slaughterhouse. verified by several Chinese and Japanese scientists. Fault lines of the earth provide the most convenient place for the release of pressure induced by the geomorphological process and triggered by LSFAOß (living state forced annihilation operator of beta type). BIS effect of type II is able to trigger the seismic episodes of 6 to 7 Richter. ​The theory claims that since the EPW travel a great distance with time, abattoirs of one location may lead to havoc in another geographical area. Theory proposes closing down of all the abattoirs in the world. This theory is a 600 page work and its hypotheses make liberal use of complex mathematical and statistical formulas. ​The theory also explores the possibility of earthquake prediction based on well defined principles. Theory may present answers to the question as to why experts have so much trouble in predicting earthquakes. ​This subject has originated from the Bajaj-Ibrahim-Singh effect or BIS effect and it was first presented in Suzdal (Russia) in 1995. Since then some scholars have written chapters on Bisology in their books, an Indian Journal has brought out a special issue devoted to the subject and several scholars have studied this subject in their Ph.D theses submitted to different universities around the world. We simply request, "Don't kill. Don't maintain slaughterhouses." That is very sinful. It brings down very severe karmic reactions upon society. Stop these slaughterhouses. We don't say, "Stop eating meat." You can eat meat, but don't take it from the slaughterhouse, by killing. Simply wait, and you'll get the carcasses.